When you think of Borneo, you can’t help but associate it with an abundance of natural attractions like caves, idyllic islands, mountains and lush wonderlands which teem with much unique native Malaysian flora and fauna. However, Borneo is not all about campsites and trudging through the wilderness as it hosts various opportunities for luxury travel as well. Most of these luxe resorts are located in the state of Sabah in and around its capital city Kota Kinabalu. The award winning Shangri-la Rasa Ria resort, which extends over 400 acres lush acres, is located on the city’s beautiful Pantai Dalit Beach. The resort offers 420 luxurious rooms and suites outfitted with amenities like air-conditioning, cable and satellite channels, complimentary Internet access and so forth. All rooms at the hotel are also equipped with their own individual balconies. The hotel offers a wide array of recreational facilities including an 18-hole golf course and three swimming pools. The resort also hosts a nature reserve onsite and offers guests the chance to avail of jungle canopy walks and treks to see native wildlife resident on Borneo. For guests who rather the kick-back and relax, the resort offers various therapeutic mind and body treatments at its full service spa along with other facilities like slow moving catamaran cruises, which depart periodically from the resort’s stunning beach front. Eight dining outlets located offer a variety of cuisines like Malay, Indian, International, Japanese and more to cater to the guest’s dining needs. 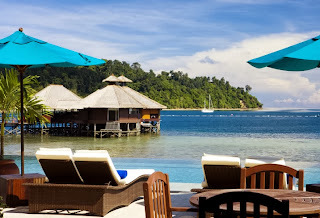 The Gayana Eco Resort located at the edge of a pristine, tropical forest on Gaya Island is easily reached via a short ferry ride from Kota Kinabalu in Sabah. 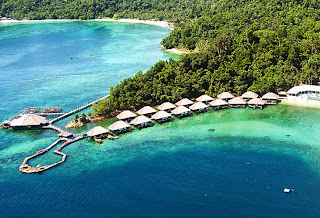 The accommodation options at the resort consists of 52 stilt villas, suspended over the sea. The designers of the hotel created these guest abodes in an effort to blend in with the traditional water villages of Gaya Island. The resort offers facilities for active pursuits like diving, snorkeling, jungle trekking and even kayaking expeditions. The resort also hosts a marine ecology center dedicated to protecting much native wildlife like turtles, giant clams and more. A star attraction at the resort it’s Solace Spa, which offers a good selection of pampering treatments for the mind, body and soul. 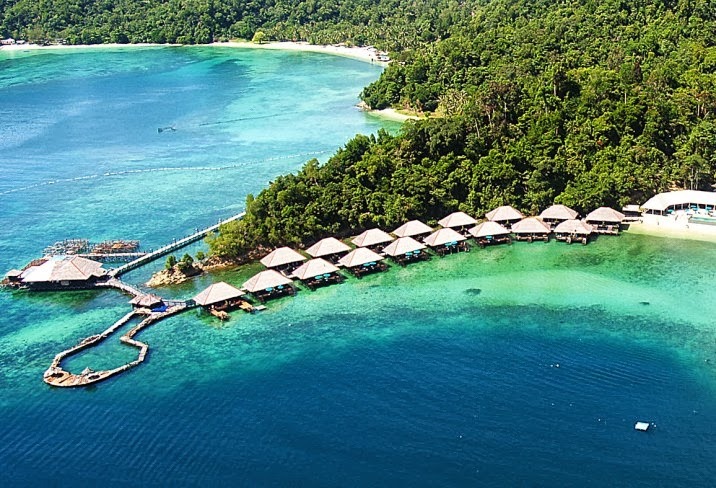 The Bunga Raya Island resort is the sister-resort of the Gayana eco resort, and shares its various facilities like the Marine Ecology Centre as well as the Solace spa. The resort is equipped with spacious villa accommodation options featuring terraces that afford views of the surrounding verdant jungle or the sparkling waters of South China Sea. The spa pavilions and treatment rooms at the Bunga Raya resort have been built in such a way that they provide the ambience of being one with nature as the treatment rooms are built into the jungle. The resort offers a smorgasbord of recreational activities like kayaking, jungle trekking, scuba diving and snorkeling as well. The Danum Valley is a lush protected wonderland in the interior of Sabah. The Danum valley is comprised of lowland rainforest terrain and is popularly referred to as the Danum Valley Conservation Area. This remote forestland teems with more than 340 species of birds, 124 species of Mammals including the elusive but adorable orangutan, 72 species of reptiles and many varieties of native flora. The Borneo Rainforest lodge is a starting point for most jungle treks into the stunning Danum valley. The lodge offers rustic yet adequately comfortable accommodations in the form of 31 chalets. These chalets can accommodate 60 guests at a time of a full board basis. They feature a minimalistic theme and are built with materials sourced locally. Each chalet is equipped with an outdoor tub attached to a deck offering gorgeous views of the lush jungle and the Danum River. The above mentioned luxe accommodations prove that a trip to Sabah on Borneo need not be a rough and tumble experience in the jungle rather you can avail of all your creature comforts while soaking in the many splendid natural attractions that Borneo has to offer. Discoveries, authentic experiences and a sense of intimacy with the natural world all prevail across the land and seascape of this resort, with its youthful vibe and sun-dappled moments, offering travellers and families an escape that is distinctively Borneo.